Roasted Brussels sprouts are a real treat. 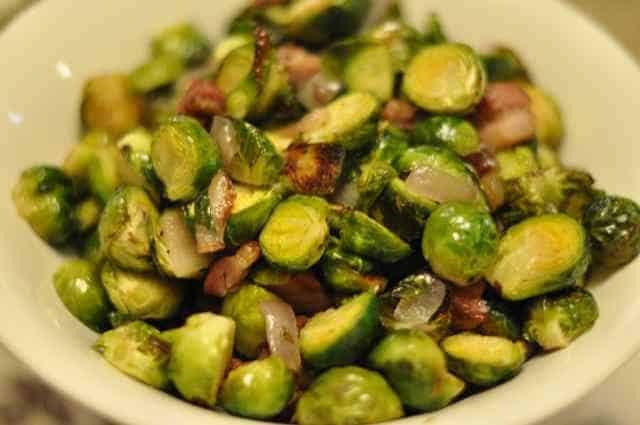 Maybe you haven’t had brussels sprouts since you were a child, maybe you only had them steamed or boiled, I promise if you weren’t a fan of Brussels sprouts you should give this recipe a try. One try of this recipe, this side dish will go into your rotation. Brussel sprouts taste even better when roasted in the oven with bacon. Slice bacon and pan fry bacon, but only partially cook your bacon, it will finish cooking in the oven, remove bacon from pan, and add diced red onion to the pan. Cook red onion until just softened. Wash Brussels sprouts an slice in half, remove any brown leaves. On a cookie sheet add sliced Brussels sprouts, partially cooked bacon, red onions along with pan drippings and mix well. Pour olive oil over the Brussels sprouts and stir until the Brussels sprouts are evenly coated. Roast for approximately 25 minutes, sprinkle with kosher salt, and add fresh cracked pepper before serving. This is a totally awesome recipe!! I have been making it for months now and my husband and I LOVE it!!! Very easy and very tasty! I made these last night and they are truly phenomenal! I used frozen sprouts and let them thaw before slicing in half and it still turned out excellent! This looks like a very good recipe. I sometimes steam or blanch the brussel sprouts, then finish by a sautee in bacon/bacon grease until they begin to carmalize. Then I pour a little maple syrup or honey on them. DE licious!